Truth about… Warning: It’s never my intention to ruin someone’s experience with food. If “we are what we eat” we should be aware of who we are and what we’re eating. This portion of the blog will focus on non-vegan food items that you may think twice about consuming. So if you want to be conscious about what you’re consuming, this is the portion of the blog you want to read. If you want to continue to eat for taste without an understanding of what you’re consuming…stop reading now! I got a few phone calls when I shared the picture above on Facebook, so I decided to do my first truth about… blog post on this food item. Shrimp is the most popular seafood in the United States, and I’m going to share 7 facts about shrimp that may make you think twice before ordering your next shrimp scampi. Speaking of garbage collectors, shrimp are bottom dwellers who feed on parasites and skin that they pick off dead animals. Ninety percent of the shrimp we eat has been imported, but the FDA tests just 0.1 percent of imported seafood for chemical residue. Imported shrimp has been found to be contaminated with banned chemicals, pesticides, and even cockroaches. 10 And all that have not fins AND scales in the seas and in the rivers, of all that move in the waters and of any living thing which is in the waters, they shall be an abomination unto you. 11 They shall be even an abomination unto you: ye shall not eat of their flesh, but ye shall hold their carcasses in abomination. 1 Corinthians 10:23 (NIV) “Everything is permissible”–but not everything is beneficial. And if the cons outweigh the pros like for everything listed above, I believe while it’s argued that it’s permissible it’s not very beneficial for my body. 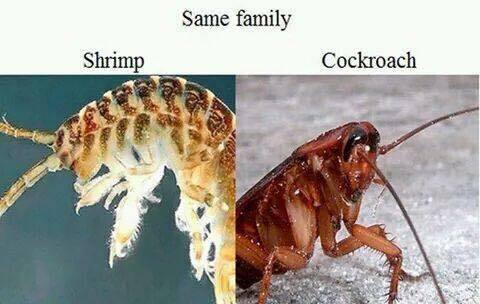 Posted on March 5, 2015, in Truth About... and tagged cockroach, religion and food, shrimp, vegan eating. Bookmark the permalink. Leave a comment.